There are many different characteristics to consider when shopping around for a good power inverter for when you’re travelling, or on the road, or otherwise far away from the grid. Power stability, maximum wattage, and noise levels are all important factors. If it’s the case that you don’t have a lot of high-power devices, and want something that emphasizes low noise levels and safety over anything else, the Go Power! GP-SW300-12 might be the inverter for you. What it doesn’t provide in power it makes up for in being solidly-built and reliable over the long term, as well as having clean output for the power it does provide. Right off the bat, it’s important to mention that this Go Power! inverter will not power some of your more electrically-heavy devices. With a continuous output of 300 watts and a surge output of 450 watts, it can still power things like smaller TVs, laptops, smaller appliances, and so on. It most certainly will not power things like surround sound entertainment systems with many-watt amplifiers and speakers, or microwave ovens. Still, 300 watts is fine for a great deal of things that need power the most, including charging your mobile devices. While the GP-SW300-12 doesn’t pack a lot of punch when it comes to power output, it makes up for it for the fact that its power output is as stable and safe as possible. Being that it’s a pure sine wave inverter, it offers a much more stable signal than ordinary inverters that try to approximate a sine wave. Beyond its use of pure sine wave output, the two power outlets on the front are GFCI-protected, and protections are in place for under-voltage, over-voltage, and overloading. These are all especially important when using things like vehicle power or solar power, where fluctuations are quite common. This Go Power! inverter runs at a modest cost. Itcan be seen by some as a little bit steep for the low amount of power that it produces. 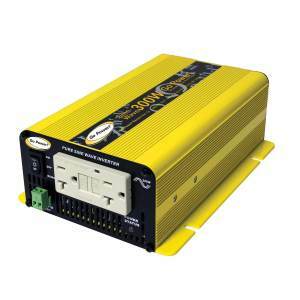 You can find pure sine wave inverters for the same price that offer more than twice the amount of power output. However, many of them do not offer GFCI protection, which can be of higher priority for some people. Additionally, this inverter is known to last for quite a while. The GP-SW300-12 is a reasonable purchase for people who prefer safety and longevity over high power output. And even for the 300 watts it does output, it does so in a very stable manner thanks to its use of pure sine wave technology as well as protection against spikes and dips in power. In this respect, it does exactly what it advertises. Its main downside is that for the price, what it offers is slightly underwhelming. It otherwise works just fine and is a decent purchase for reasons other than its wattage. The company also offers a 2 year warranty, which is quite a bit of time for something like a power inverter. Purchase one online at a great price here! Is the pure wave the same as the Square wave? Discover the best wave inverter!